Looking something like a drill press, a milling machine uses a cutting tool that moves in all three dimensions, removing material to achieve the desired part shape. The cutting tool usually rotates about an axis that is perpendicular to the table that holds the material to be cut. A cutting tool protrudes down from a rotating spindle. A block of material is placed on a moving table below the cutter. While the cutting tool turns, a computer controls the vertical (Z axis) motion of the cutter and the horizontal (X and Y axis) motion of the block of material. The cutter is guided to move through the material, removing portions to create shapes. Additionally, the material can be turned to various orientations in the middle of the process and cutting tools of various shapes can be used. Plain endmill – used for most milling – creates walls with straight 90 deg edges and sharp corners at the bottom of recesses. The material is usually removed by both the end and the side of the cutting tool. Although setup tooling is mainly software, custom jig tooling is often required for work holding. This machining process can handle most rigid materials including most metals: Aluminum, Stainless Steel, Copper, Steel, Brass, Titanium, Sterling Silver, Bronze, etc. ; hard plastics and other materials: Nylon, Acetal, Polycarbonate, Polystyrene, Acrylic, Fiberglass, Carbon fiber, PTFE, ABS, PVC, etc. 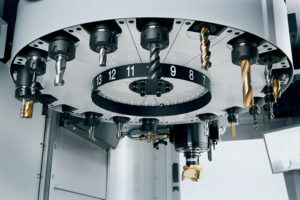 Milling has several advantages over other manufacturing processes. It is cost effective for short runs. Complex shapes and high dimensional tolerances are possible. Smooth finishes can be achieved. CNC milling can produce almost any 2D or 3D shape provided that the rotating cutting tools can reach the material to be removed. Examples of parts include engine components, mold tooling, complex mechanisms, enclosures, etc. Providing corner radius of 10% or more of wall height is ideal. Provide shapes that are practical to hold during machining, such as straight edges. Generates a cut surface with a visible pattern resulting from the rotation and movement of the cutter. As the milling process applies pressure to the material, weak shapes are difficult to machines, such as long thin shapes and thin walls. Cost reduction options include reducing the amount of material removed, limiting complexity, avoiding intricate features and making shapes that are easy to hold. We stock a wide variety of materials, use state-of-the-art machines and diligently follow all design specifications. We continually strive to improve and optimize our processes and maximize customer convenience. Our customers range from investors to businesses to government agencies. We are focused on quality and customer service.